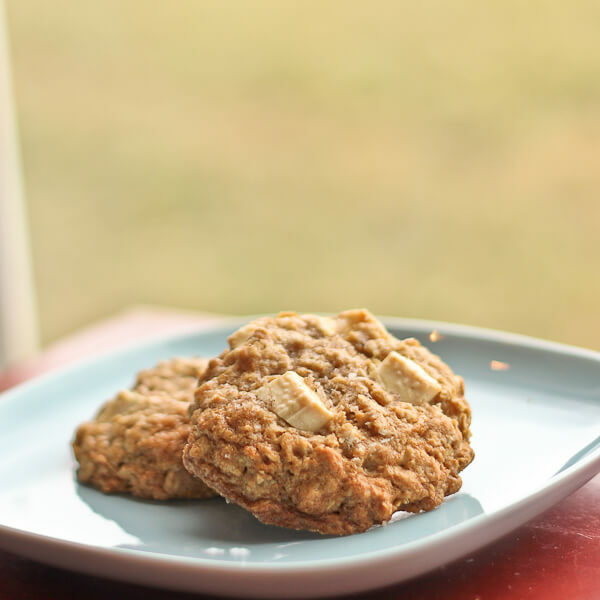 I think by now regular readers of this blog know that I prefer thick, crispy on the outside but chewy on the inside cookies. So it should come as no surprise that these cookies were a huge hit by virtue of their texture alone. That their flavor is absolutely amazing just makes them that much more perfect. Yeah I said it. Perfect. This is a perfect cookie. The recipe I started with (and remained true to the spirit of) is from Shauna Sever’s Pure Vanilla: Irresistible Recipes and Essential Techniques , about which I have been feeling guilty for about 5 months now. When I was reviewing her Marshmallow Madness! : Dozens of Puffalicious Recipes (which I also reviewed kinda late), I happened to notice that she had a new book on vanilla. I love vanilla. So I contacted the publisher and shamelessly begged for a review copy. Then I basically got sick for 2 months–and not just any 2 months, but the 2 month span during which I acquire the most cookbooks. Which means the pile of cookbooks waiting to be used extends practically to my ceiling (or it would if I put them all in one pile). So suffice to say that while I never forgot about this book, it also was competing with literally dozens of other cookbooks. I was looking for a baking project the other day and pulled the book out. It is a gorgeous book; with about 80 recipes it is neither large nor tiny. Many of the recipes are accompanied by mouth watering photos. 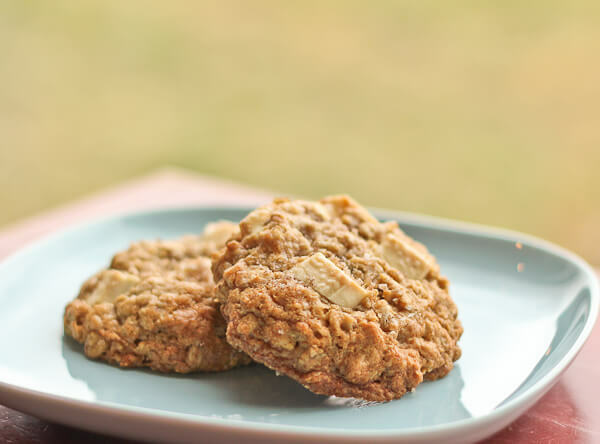 I was looking for a vanilla twist on a simple chewy drop cookie, and these oatmeal cookies fit the bill perfectly. This cookie is going to be fantastic no matter what. But to really elevate it, make sure that you use a white chocolate bar broken into chunks, rather than vanilla chips; add the seeds from a Bourbon vanilla bean; and, most important, do take the time to make the vanilla sea salt. This last is sheer genius on Shauna Sever’s part, and, if I had paid for the book, I would have said it was worth the price for that idea alone. She recommends using fleur de sel, but I am frankly too cheap and usually “settle” for a moist and coarse grey sea salt from Northern France. To this I added ground vanilla beans (about 1 tablespoon for 1/2 cup salt), and the next vanilla bean that I use I plan to put the husk into the salt to infuse it even further (you could use only the husk if you cannot find the ground vanilla beans). If you like salted sweets the way that I like salted sweets, the vanilla salt has literally endless uses. Whisk together the flour, salt, baking soda and cayenne powder. Mix in the oats. Set aside. Beat the butter until creamy. Add the vanilla seeds and extract and beat until completely incorporated. Scrape the sides and bottom of the bowl. Add the sugars and beat on medium-high speed until light and fluffy, at least 2 minutes. Scrape the sides and bottom of the bowl again. Add the eggs one at a time, beating to incorporate after each addition. Scrape the bowl as needed. Add the oats and flour mixture on the lowest speed (or mix gently). Fold in the white chocolate chunks. Cover the dough with plastic wrap and let chill for at least 1 hour (the dough will last in the fridge for 3 days). When you are ready to bake, preheat the oven to 350 F. Line a baking sheet with parchment paper or a silicone mat. I used a heaping tablespoon for the pictures I took because hefty cookies are the most attractive. But the majority of my cookies I made with heaping teaspoons for portion control. Small and large both work equally well. Make sure the balls of dough have at least 2 inches around them for better air circulation in the oven. 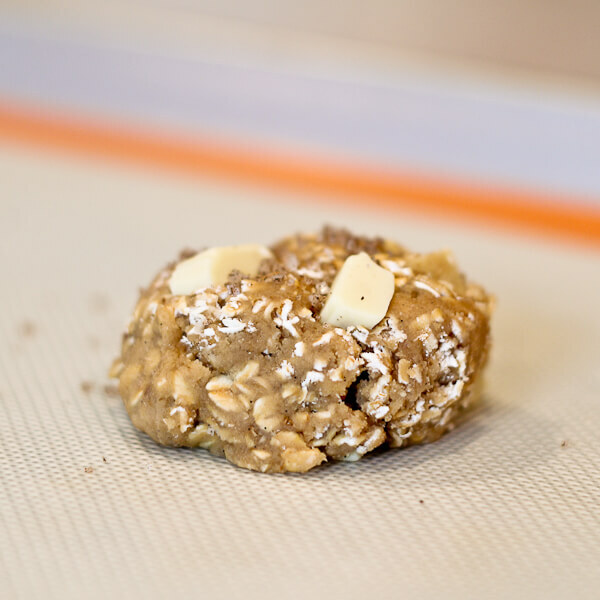 Sprinkle the balls of cookie dough with the vanilla sea salt. Bake for 9-15 minutes, depending on the size of the cookie. Just keep an eye on them--the finished cookie will be golden at the edges but still a bit soft in the center. Let the cookies cool for 5 minutes on the cookie sheet before transferring them to a cooling rack. Stored in an airtight container the cookies will last at least 24 hours--they never made it past that point in my house. I’ve been debating whether or not to get this cookbook because on the one hand I love Shauna’s blog and know that I’d adore it…and on the other I have a lot of cookbooks already! But you make it sound worth it. 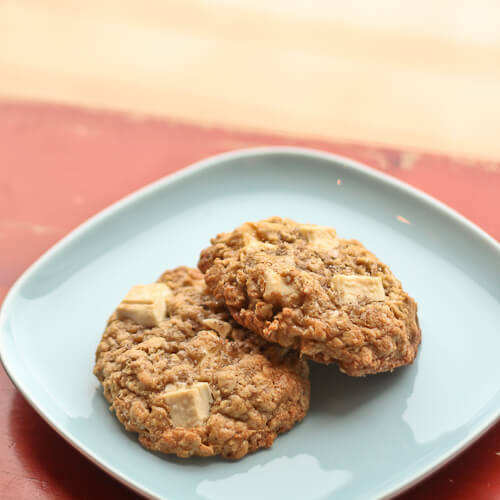 I love a good oatmeal cookie and this definitely fits the bill! I won this cookbook in a giveaway. I haven’t used it yet, but I should get it out and make these cookies! That is a drool worthy cookie. Plus the oatmeal in it makes me want to try this recipe soon. those huge hunks of white chocolate are AWESOME! I LOVE this cookbook!! So far I’ve made the Heirloom Vanilla Sugar Cookies and the Honey-Vanilla Granola, and they were both really, really good! It also inspired me to finally make my own vanilla extract and vanilla sugar. These cookies are ones I really want to make soon. They look fantastic! wow…perfect? that’s a pretty good sell! i’m definitely adding these to the “to try” list! These look like they taste good. 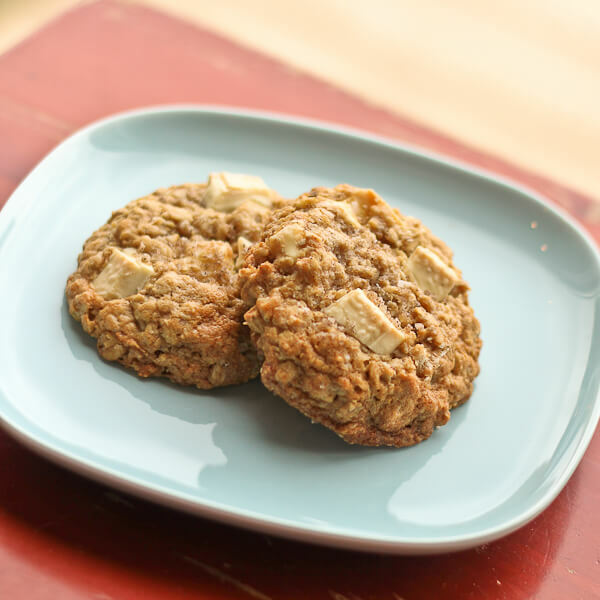 I love oatmeal cookies. What you did with the chucks really makes me want to bake a batch tonight! Thanks for sharing! 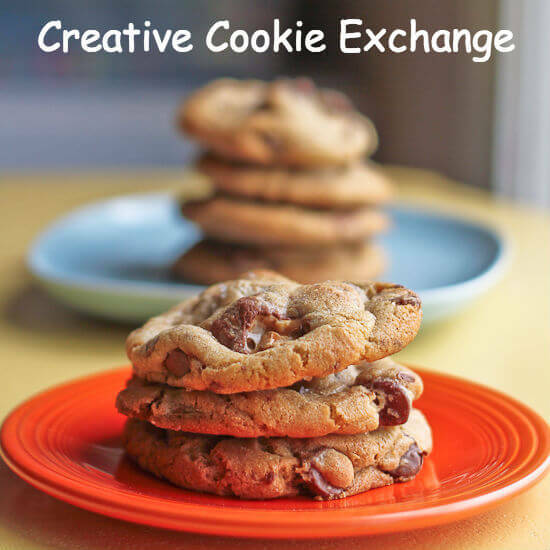 These cookies look amazing–I love salty & sweet and the idea of vanilla salt is so appealing!